#PeruRumboGSoC2018 – Session 5 | Sólo para Mí! We were able to cope with different packages and versions to work with WebKit and GTK on Fedora 26 (one of the students have a 32 bit arch), and on Fedora 27 One of the accomplishes today was coding a Language Selector using GtkListBox and GtkLinkButton with GTK and Python, here in detail. Newcomers bug list on gitlab was also checked today, specially of the applications gnome-todo and gnome-music. As well Fedora Docs Dev,system-config-language and the implementation of Elastic Search were evaluated and discussed as possible GSoC 2018 proposals for Fedora. Thanks @zodiacfirework This is the final chart of the effort of the participants. In this picture we have Cristian (18) as @pystudent1913 and Fiorella (21) as @aweba. They are the top two! 🙂 We have shared a lunch and some food at the afternoon. Thanks again to our sponsors: GNOME, Fedora & Linux Foundation for the support of this challenge! gogogo PeruRumboGSoC2018! 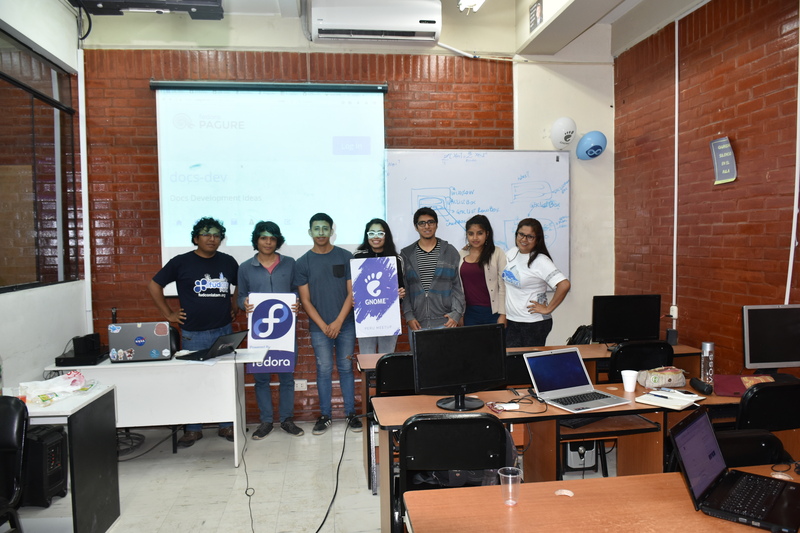 This entry was posted in FEDORA, GNOME, τεχνολογια :: Technology and tagged #PeruRumboGSoC2018, fedora, GNOME, GSoC, GSoC Fedora proposal, GSoC GNOME gitlab, GTK 3, gtk.py, Julita Inca, Julita Inca Chiroque, LinuXatUNI, PeruGSoC, Python. Bookmark the permalink. Pingback: #PeruRumboGSoC2018 – Session 6 | Sólo para Mí! Pingback: My 2017 Fedora​ in a Review | Sólo para Mí!